Dedicated to simple decor ideas - especially in white! - inspiration for living simply, reusing what you have, and scouring for vintage or thrifted finds. Some of my own DIY projects described here too. If you need a little eclectic infusion into your home, or throughout, here's a really great find, sure to inspire: Bazaar Style. Not only does it capture the essence of beautifully re-purposing objects, textiles and furniture (eg. with a coat of white paint), it defies (magazine) style trends, mixing furniture and fabrics across time. Its also ecological and economical. Arguably, bazaar style takes time to develop. It takes years to collect treasures, furniture and fabrics, authors Selina Lake and Joanna Simmons assert. More poigantly, they argue that the trend of 'pairing down, putting away and use of pale colors is a blip' in the history of Western decor: It seems that people have always craved color in their homes; since Medival times, people have painted walls (beginning with lime wash) and put up wall paper since the mid-1800s, especially with the development of richer dyes. 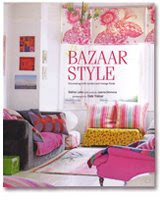 While the pictures in Bazaar Style are lush, often teaming with charm, the text describes how to layer color and pattern, encouraging boldness, offering streams of ideas, to personalize each room in the home. Throughout the book, care is given to the function of items and rooms, helping to plan rooms, place furniture, focal points, displays, the feeling captured by one's decor scheme. Have you read this book yet? Its a must read, full of many fresh, colorful ideas, and happens to feature a lot of pink, a color I have fallen for since having a little girl. Here, take a peek inside. More of Selina Lake's sumptuous pictures can be seen here. As a sociologist, I have always been interested in how our we are affected by what surrounds us. Our home is so deeply personal, and has such potential to give us happiness, calm, and refuge. Home has become even more important to me since becoming a mother of 2. Currently, I adore homes that play with light, white, texture, nature and bits of colour. These days blogging happens when my hubby is on holidays and get a sense of renewed energy and creativity to carry on. ikea hacker - Have you heard of this yet?